We now carry several nutraceuticals to improve and restore your vision based on your lifestyle. We have a nutraceuatical for patients with Diabetes, Macular Degeneration, Dry Eyes and for those athletes looking for sharper vision and quicker reaction time. To properly recommend the right nutraceutical for you, we will do a wellness screening called "EyeDentify." This screening allows us to look into the eyes and see what your individual needs are in a supplement and what other life style changes you may want to make to improve your vision such as diet and exercise. For further information on this screening program, please see the "What is EyeDentify?" tab at the top of our home page. Citrus Vision stocks several brands of frames to suit all budgets. 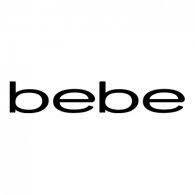 We carry brands to suit your lifestyle and personal fashion preferences. We will always go above and beyond to find the perfect frame for you, our valued patient. We work with several frame companies designed to help you find the perfect look. 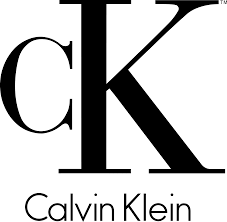 Not only do we carry the top brands in eye wear in house but we also have an extensive network to special order other brands as well per patient request. Single Vision - corrective lenses with one distinct optical power. Bifocal - corrective lenses containing regions with two distinct optical powers. Bifocals are commonly prescribed to people with presbyopia who also require a correction for myopia, hyperopia, and/or astigmatism. Trifocal - corrective lenses containing regions three distinct optical powers. The three standard regions are distance at the top, intermediate in the middle, and reading towards the bottom of the lens. 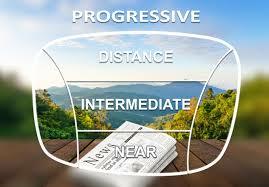 Progressive - corrective lenses containing regions with multiple optical powers. Commonly referred to as "no line bifocals", progressive lenses correct vision in 3 areas, distance, near, and intermediate. The right lens is just as important as the frame shape, color, or size. The lens choice will determine the thickness and visual accuracy of your prescription. Polycarbonate - the most impact resistant material. They are lightweight, have built in UV protection, and are highly recommended. Originally used primarily for industrial safety glasses, they are now the industry standard. High Index - thinner and lighter lens designs. Most often used for patients with a higher prescription looking for a more cosmetically appealing lens, this design offers precise optics with a stable and natural viewing experience. There are different levels of high index - be sure to ask our optical staff which one is right for you! Trivex - Ultra lightweight impact resistant material offering superior optics. There are many enhancement options that increase clarity, reduce glare, and offer protection for your eyes and your investment. There are different levels of anti-glare protection including one that is specifically designed to deflect the blue light emitted from fluorescent lighting, computers, and hand held devices. Blue Light Protection Filter- In todays world the average person is exposed to harmful blue light 8+ hours per day. Blue light emits from electronic devices such as computers, phones, tv and fluorescent or LED lighting. We have lens options available to protect your eyes from blue light exposure and reduce the risks of developing cataracts, macular degeneration and eyelid cancers. Anti-Glare - improves the quality and the value of your lenses. 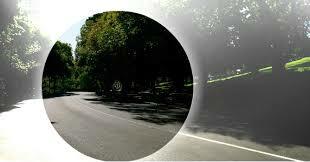 Anti reflective technology reduces disturbing glare and makes your lenses more attractive. You will experience the most precise, crisp, and clear natural vision in a way that is not possible with untreated lenses. Combine an anti-glare coating with a blue light filter lens for the ultimate level of protection and clarity. Mirrored - a surface coating applied to the outside of a lens that absorbs more light than un-coated lenses. The reflective property of the lens means it will appear darker and add additional glare protection. Polarized​ - these lenses possess a filter that reduces the amount of reflected light that enters the eye. This filter reduces reflected glare which is most noticeable on water, snow, or concrete and asphalt surfaces. Polarized lenses combined with anti-glare offer the bet protection from harmful UV rays. 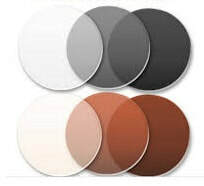 Tint - Fashion tints or tints to protect light-sensitive eyes are also available in a wide range of colors in both solid and gradient options. Extend the life of your lenses by purchasing a refillable bottle or two of lens cleaner. ​ Feel free to shop the other accessories we carry while you're here!